P.C. 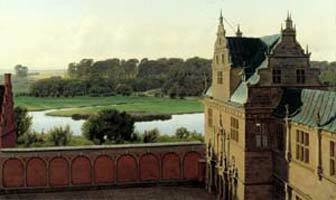 Skovgaard’s View from Frederiksborg Castle was originally painted as part of a decoration project that he and J. Th. Lundbye carried out in 1842 in a room in a Copenhagen apartment that belonged to Skovgaard’s uncle Kristian Aggersborg. The decoration mainly consisted of three almost equally large wall sections and had the character of programme art: all three pictures showed a famous historic building in Denmark against a background of typical Danish landscapes. The now divided room decoration was a tribute to Danishness, a National Romantic room installation, and as such a neglected masterpiece of Danish Golden Age art. Skovgaard does not show a prestigious view of the castle, for example by having a prominent facade fill out most of the picture surface. Instead he looks away from the building – but does show enough so we know where we are – and lets our gaze glide over the landscape. The movement of the gaze through the picture from viewpoint to horizon, from castle to forest – embodied by the only actors in the painting, the two walkers on their way into the forest in the background – describes the frictionless merging of Danish history and Danish nature that formed the core of the Golden Age worldview. P.C. Skovgaard is known as a painter who captures something particularly Danish in his landscape paintings. He was very fond of painting the Danish beech forests as a motif in carefully elaborated compositions where the sun shines and idyll is the order of the day. By placing the emphasis on harmony in the picture he did a great deal to create our national notion of the gentle beauty of our country. P.C. Skovgaard’s landscapes are based on – and intend to reproduce – an awareness of Danishness or patriotism via the landscape. Programa didáctico "Palacio Real Testamentario"